That's right--our own Kevin Cannon has gotten an Eisner nod for his James-Bond-meets-Jack-London arctic tour de force Far Arden! Revel in the glory and check out the formidable competition on the Eisner nominations page! The first issue of Star Trek: TNG: Ghosts came out this Wednesday, and there's an early review up on TrekMovie.com! I'm pleased that Mark Martinez (the reviewer) feels that the story hews closer to the more detailed and serious Next Generation stories rather than the action-focused recent movie, and states that "...those of you who grew up with the Enterprise-D will feel right at home." High praise, indeed. 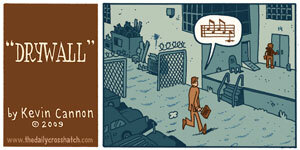 I hope readers will feel like this comic comes close to capturing the spirit of the 24th century. ...The remainder you can write yourself if you're vaguely familiar with The Next Gen: Riker is impatient (Page 2), Picard is diplomatic (Page 2), Troi feels overpowering emotion (Page 5--but not addressed until Page 16! ), and Geordi solves a problem with 24th century science (Page 19). All that was missing was Data commenting on humanity and Worf jumping over his console. Well, all I have to say is don't count us out yet! We'll make this a drinking game if it kills us. 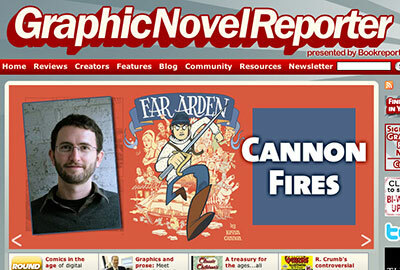 I recently did an interview with John Hogan over at Graphic Novel Reporter. Check it out! Also check out their main page -- there are some great interviews with Junot Diaz, Emmanuel Guibert, and local physics hero James Kakalios. T-Minus reviewed by Todd Klein! Ottaviani and the Cannons make excellent use of the comics format to tell this complex story in interesting ways. (...) Parts of the story are told simultaneously through the clever use of large panels and small panels on the same pages, each telling a different narrative. You can check it out, as well as his other reviews, tips, observations, and dissections of the finer points of comics lettering at kleinletters.com. Hard to believe that it was well over a year ago when a few of the Lutefisk Sushi C curators sat down to ask the all-important question: "What's next?" 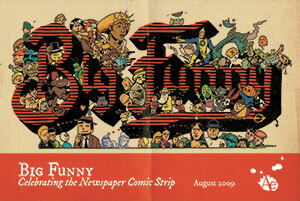 Well, what's next is BIG FUNNY -- the hybrid gallery show and 48 page comics section. The printed newspapers have been sitting quietly in a secret location on Quincy Street, with only a handful having been released to the media. The paper will be released to the public (for a measly $5) at the opening reception this FRIDAY, AUGUST 7. So come down to the opening this Friday and join over forty artists and their friends and family, as well as the Roe Family Singers. In addition to the long-awaited newspaper, you'll be able to check out original artwork from the paper, century-old newspaper strips (thanks to Steve Stwalley! 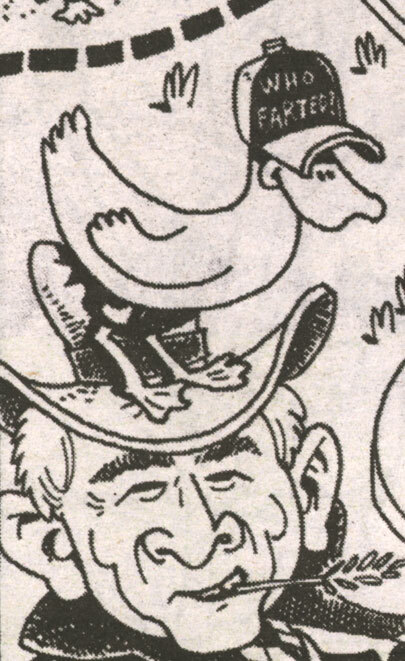 ), and never-before-seen original work from cartoonist William Ede. Plus, the first 70 people to buy a copy of Big Funny at the opening get THIS. Minnesota Public Radio's Art Hounds is a weekly series where local artists talk about something they're enjoying in a medium other than their own. 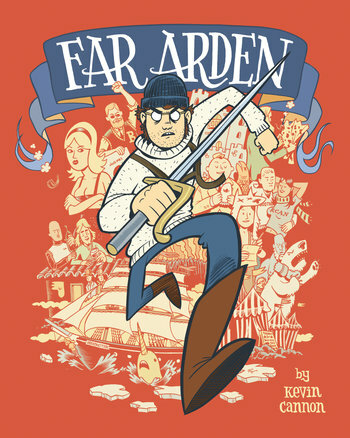 This morning Britt Aamodt -- journalist, local radio personality, and author of an upcoming book on Minnesota cartoonists -- talked about Far Arden. Thanks, Britt! 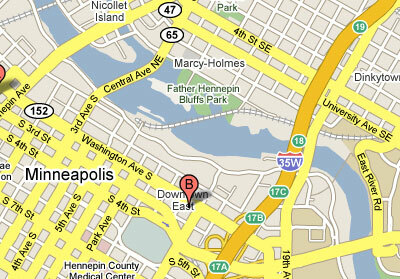 You can hear Art Hounds archived on mprnewsq.com, or listen in today at 4:45pm to 91.1 FM for a rebroadcast. My Science Cartoon Needs Your Vote! The Union of Concerned Scientists is back again with Science Idol, a cartoon contest that is ostensibly named after a popular American children's television program. For the second year in a row one of my cartoons is a top twelve finalist, and I need your vote to make it to that coveted #1 spot. You can click here to read about the contest and click here to vote. Fun fact: After I drew the above cartoon, I learned that the oval office desk pictured is actually built from the famous ship HMS Resolute, which was stranded in the arctic on its way to rescue Franklin in the 1850s. 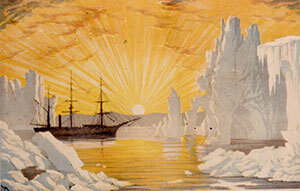 The ship was eventually rescued by James Buddington and sent back to England. The Queen then turned around and made a desk out of it as a gift for President Rutherford B. Hayes. However, Wikipedia tells me that if you've seen the film National Treasure: Book of Secrets, then you already know all this. T-Minus: The Race to the Moon on Marty Devine's MAD WORLD, The X-Librarian, Savannah Morning News, and Telegraph-Journal. 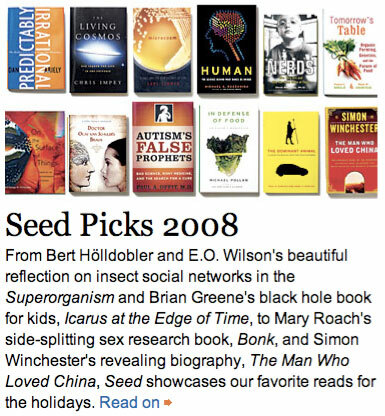 Far Arden on Bookforum and School Library Journal. Stuff of Life on The Johnandjanaverse. 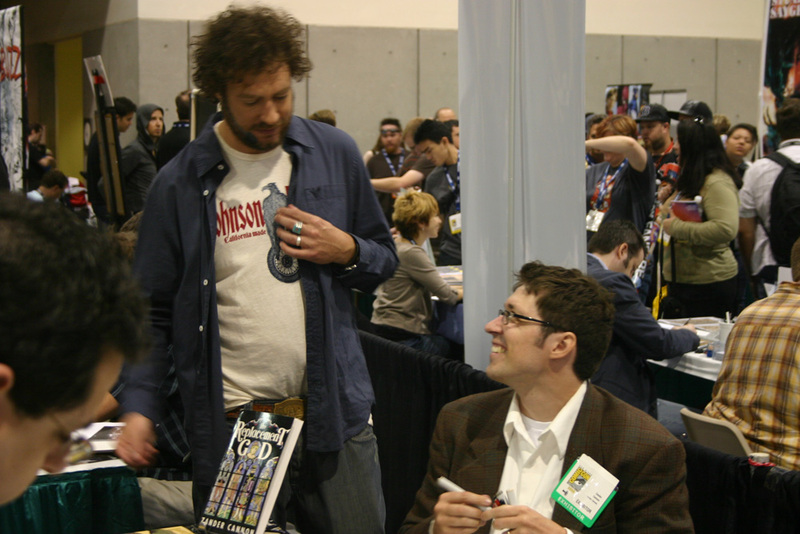 Zander Cannon and Kevin Cannon will both be at Comic-Con International 2009! Hi folks, I hope you're all as excited as we are to be going to Comic-Con in sunny San Diego this coming Thursday. Kevin and I will be there to chat you up, tell jokes, draw sketches, and, in a departure from our usual inwardly-focused convention personas, give panels! 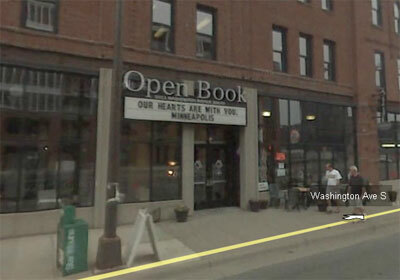 Here are our two locations in the context of the whole place. 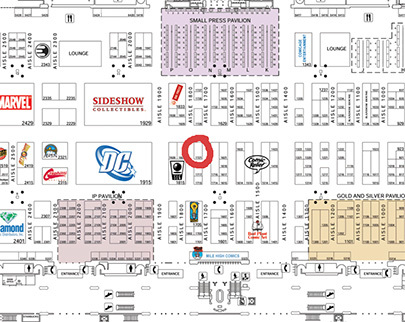 Zander will be on the left, in Artists Alley, Kevin will (primarily) be on the right, at the Top Shelf booth. 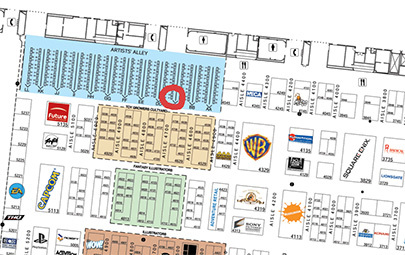 Zander will be at CC-01, which you can remember by thinking "CC=Comic-Con, and 01=Zander is Numero Uno". Easy! Kevin will be flogging his new hot book Far Arden at the Top Shelf booth, number 1721, which you can remember by thinking "R-rated movies, alcohol". We will also be doing panels. As mentioned in a previous post, Kevin will be contributing to a Top Shelf panel at the same time that I will be giving a talk on how to do comics in the small, medium and big press. Looking forward to seeing you all there, amigos! Tim McNiff is Touching Our Book! 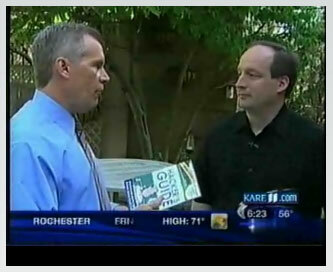 Check out this fun interview with KARE11's Tim McNiff and local Head Hacker Bruce Stasch. This past winter Zander and I worked with Bruce to create the Hacker character & identity, and eventually produced the cover design and some spot illustrations for Hacker's Guide. Just a few weeks ago I was stumbling around Barnes & Noble and saw a big golf-themed table display with Hacker's Guide sitting front and center! Ego boosts are fun. Can't make it to the gallery opening at Altered Esthetics on August 7th but want to grab a copy of Big Funny? You can now pre-order a copy (limit one per customer at this point) on the Big Funny website. If you don't have a paypal account, you can use a credit card. The massive, 48 page Big Funny newspaper is $5. If you're pre-ordering one we tack on $5.95 for shipping & handling. 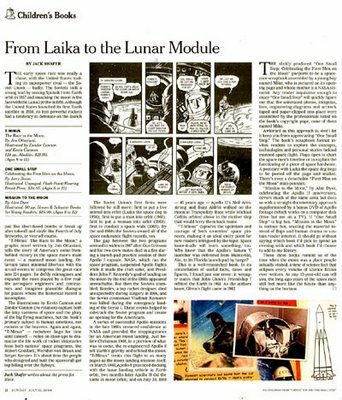 Zander and Jim and I were thrilled to learn that our latest graphic novel, T-Minus: The Race to the Moon, is featured in today's New York Times Book Review. This is a huge honor and not one we would have ever expected! Jack Shafer's review is available to read online at NYTimes.com. Game Informer Braid 2 joke makes it to the official Braid blog! 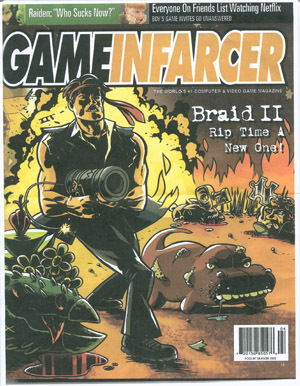 As everyone who reads this blog surely knows, once a year we draw an illustration for Game Informer's April Fools edition, "Game Infarcer". This year, as luck would have it, the topic was Braid, a game that I absolutely loved, and I was thrilled to draw a parody of it. Better yet, the guys over at GI just let me know that Jonathan Blow, the creator of Braid, put up the image to joke about a sequel to Braid. Nice! Here it is on the official Braid blog, and here is the image without all that dang copy. 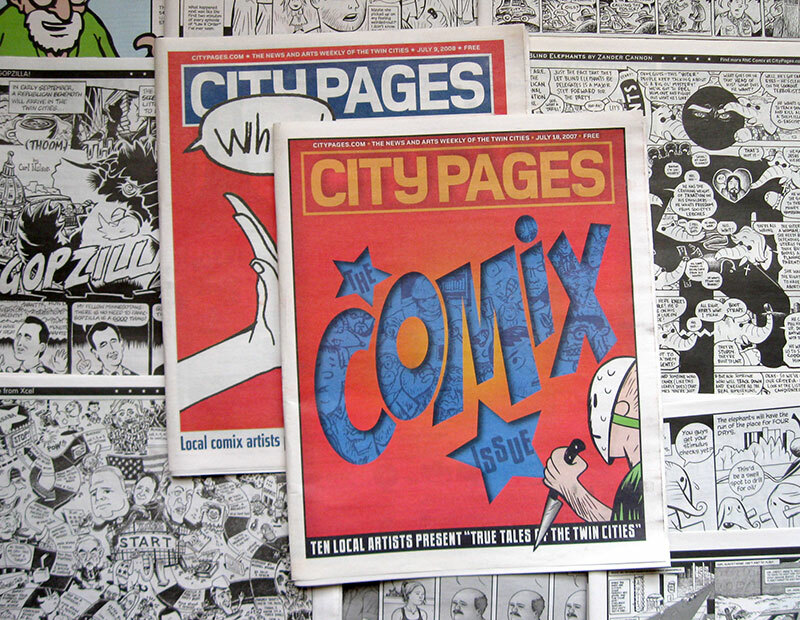 City Pages Annual Comix Issue: CALL FOR ENTRIES! It's that time of year again: City Pages is gearing up for its third annual City Pages Comix Issue and is looking for submissions. 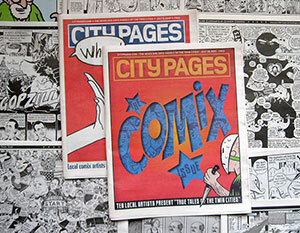 City Pages has a readership of over 50,000 discerning eyes, and is thus a great showcase for any cartoonist. And even if your cartoon isn't picked for the print edition, it will be published online. 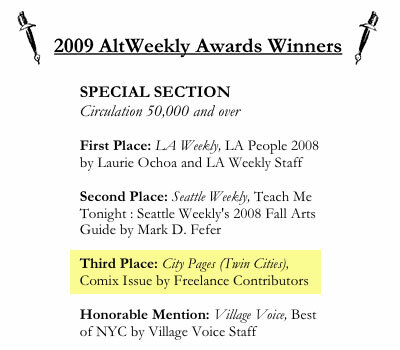 Don't forget, last year the Comix Issue won a prestigious AltWeekly Award! This year's theme: "MINNESOTA NICE"
Deadline is Wednesday, August 5th. That's when we'll close the space and figure out what we have to run. If there's any changes that need to be made or if a work is not finished, we have one more week, but we're not any more slots past the 5th. There is a finite amount of space for the print edition. DO NOT FEEL LIKE YOU WERE PASSED OVER BECAUSE YOUR STUFF DIDN'T MAKE IT IN TO PRINT. We'll put everything we get up online. If you want/need to do something larger, contact me first, otherwise don't necessarily expect it will run in print! (half page is 9.75" wide by 5.4" tall; full page is 9.75" wide by 11.25" tall). Black and white JPEGS, 300dpi actual size, or larger (fit to scale). Every email needs to have the title of the piece and the credit (how you'd like your name to appear in print). We will also need a W-9 (click to download) filled out and attached to the email with your real name and address if you want to be paid. Those who sent in a W-9 last year and got paid will not have to send one if their address hasn't changed. Payments are $25 to all, another $25 if your panel makes it into print. That is the same rate no matter what size it ends up being. Congrats to Tim Sievert and City Pages Cartoonists! First off, congrats to Tim Sievert (former BTA employee and current PUNY wizard) for his Harvey nomination for "Best New Talent." Of course, Tim's amazing work is anything but new to us here in Minneapolis, so it's about damn time he got nominated for this award. Tim is being nominated for his Top Shelf book That Salty Air, and you can read about his current project, The Intrepideers, here. 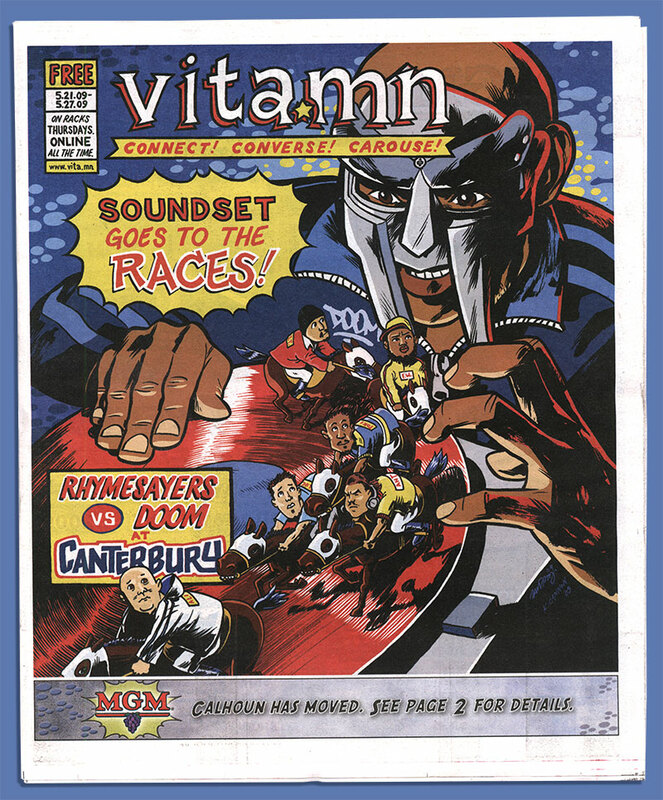 You can read all the comix online. 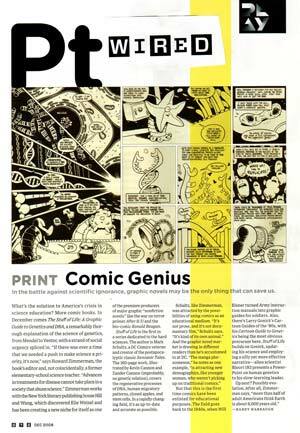 Congrats to all involved, and stay tuned for information about this summer's City Pages Comix Issue! 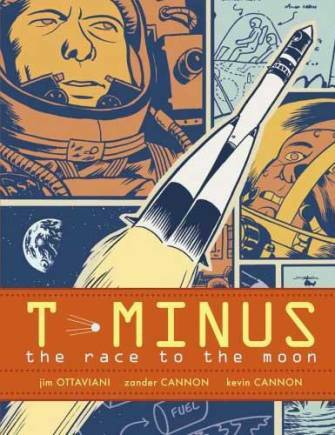 Our friend, collaborator, and co-author of T-Minus Jim Ottaviani gives a long and insightful interview about his space race tour de force on The Comics Reporter. Tom Spurgeon always conducts excellent interviews, and this is no exception. Pick one up -- it's FREE. 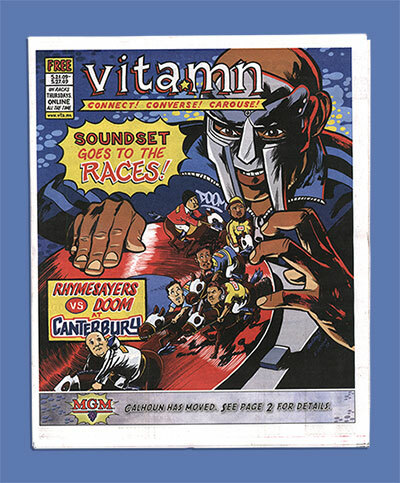 Thanks to Leslie at Vita.MN for asking us to do the cover! Hey Top Ten fans, I just want to thank you for the outpouring of support I hear we've gotten about wanting to see the story continue. It's gratifying to know that people care so much about these characters and this world that they will take the time to write in and make their preferences known. Now, I should also say that my editor's getting a lot of mail that is less than constructive about the fate of Top Ten and what's to be done about it, so let's take this opportunity to go over a few thoughts, shall we? 1. You get more flies with honey than with vinegar. That is to say, you improve the chances of Top Ten continuing by sending positive emails that focus on your deep love of the series and your honor-bound promise to buy every issue that comes out than by insulting DC, Wildstorm, the editors, and the accountants and accusing them of playing bait-and-switch. 2. Speaking of which, there are many factors that have led to the current situation, and things are not always as black-and-white as they may seem. It's always tempting to find a villain in a difficult situation, but I can tell you that everyone involved acted with good intentions and everyone wants to put out a comic that people love and will read. 3. This is a follow-up to this post, in which I posted a summary of events, calling it "the semi-official statement from Wildstorm through me". While I typed that in good faith, feeling that it was an accurate representation of what I had heard, it was not in any way an official statement, and I retract that label. I don't speak for Wildstorm, and I am not privy to their decision-making process. 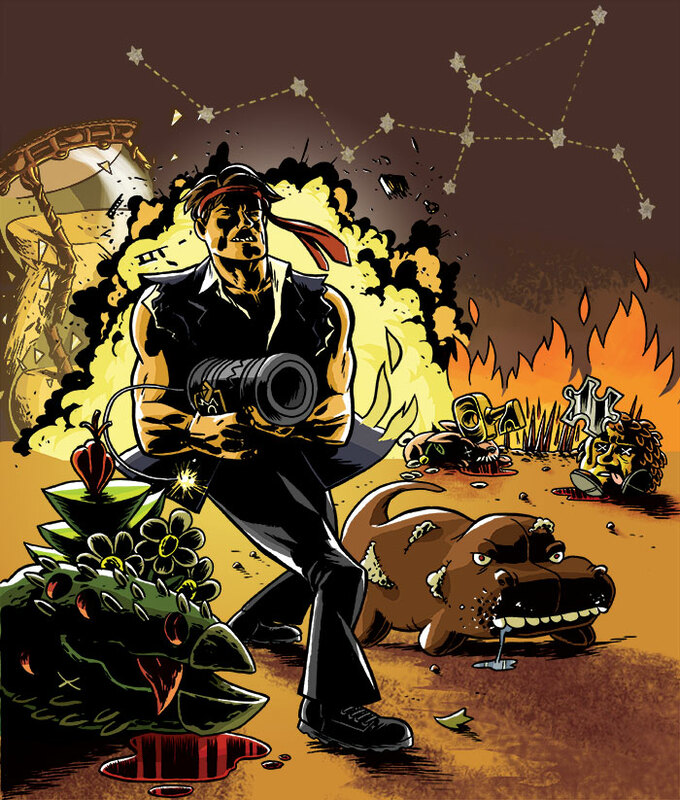 Friend of BTA and collaborator on two projects (Bone Sharps and T-Minus), Jim Ottaviani is the man to talk to about science comics. Here at Yet Another Comics Blog, he gives an interview about the process of making T-Minus and has some nice things to say about his co-authors. Top 10 Season 2 continuing? UPDATE: I've just written about the situation in another post; you can find it here. Let's let them know Top Ten has some fans out there! But ask nicely, won't you? For me? 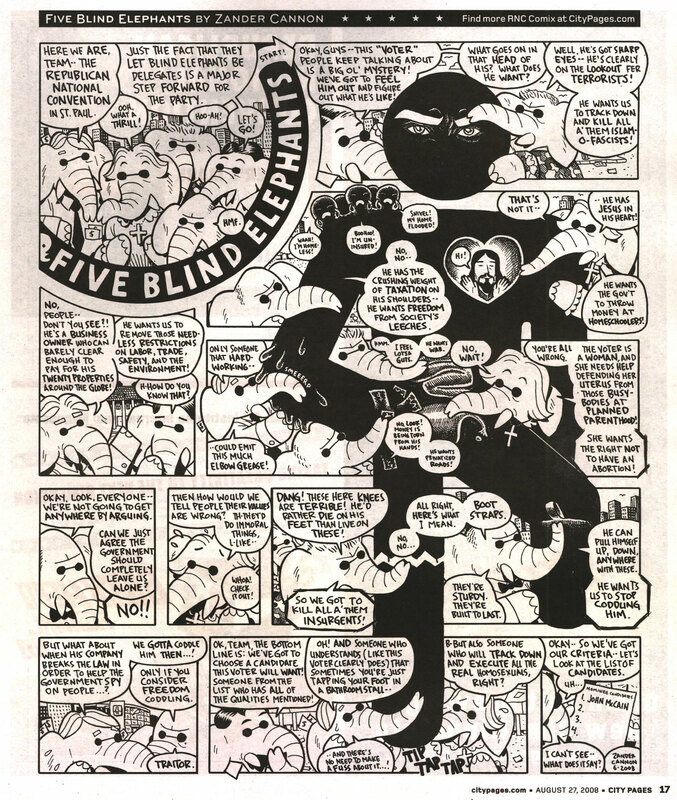 The series was originally conceived as an 8-issue story with 2 standalone specials. The first special, focusing on the courtroom dramas in a superhero city, is coming out next month with art by Da Xiong. Wildstorm and DC are looking at the sales and response on these 5 comics and using that to determine how to continue the series. EDIT: Wildstorm has not made any official statements on this matter, and to my mind the decisions that they made have been understandable. I apologize if I portrayed them to be unreasonable or unresponsive. EDIT: Rich Johnston has put out a call to save Top 10 on his Lying in the Gutters column on Comic Book Resources. Thanks, Rich! 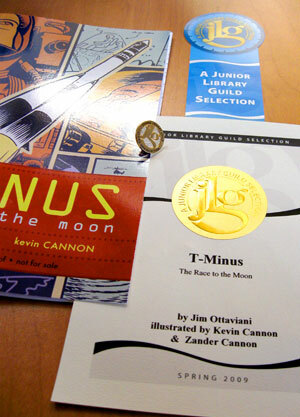 Zander and I (and Jim) were excited to learn recently that the Junior Library Guild has picked T-Minus: The Race to the Moon as a Junior Library Guild Selection for Spring 2009. 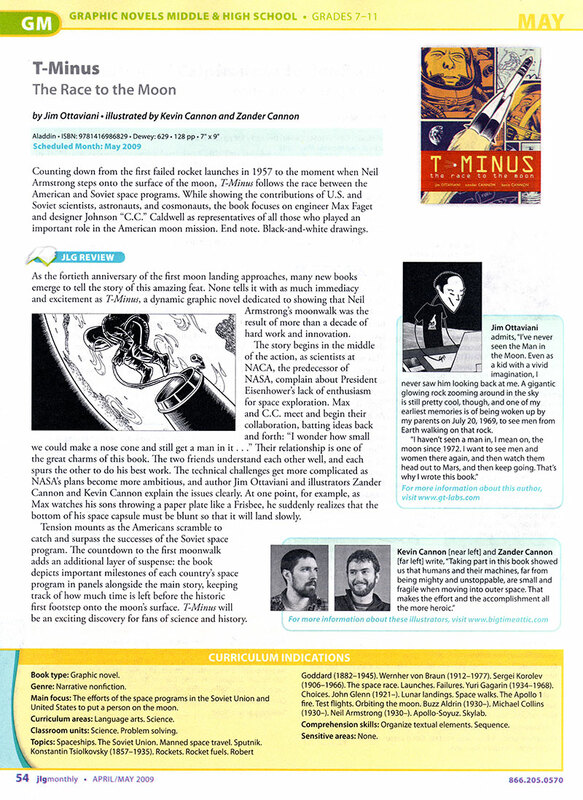 JLG highlights soon-to-be-released books that they believe will provide "excellent reading experiences for children." We know what a great book T-Minus is (because we've been living and breathing it for the last year) so it's exciting that JLG feels the same way! I should stress, though, that while the "official" age range for T-Minus is listed as 8-12, the Junior Library Guild recommends it for grades 7-11 (ages 12-17), and we here at the studio feel like there is nothing about the book that skews terribly young. From the candle-lit sketches of Tsiolovsky to Germany's V-2 rockets to the various disasters and successes of US and Soviet rockets, it's a well-rounded introduction to the space race. And in Jim Ottaviani's capable hands, the whole epic story is seen through the eyes of two NASA engineers, Max Faget and CC Johnson. So don't let the age range scare you away! I recently did an interview with Alex Dueben at Comic Book Resources, in which we talk about Top Ten, The Stuff of Life, T-Minus, and a little-known new project of ours at IDW, Bumblebee. 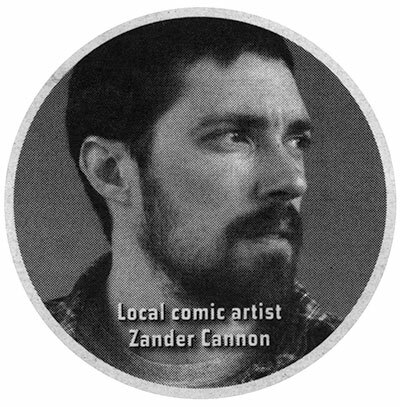 Zander Cannon giving a talk at the Loft Literary Center on Tuesday, March 10th! 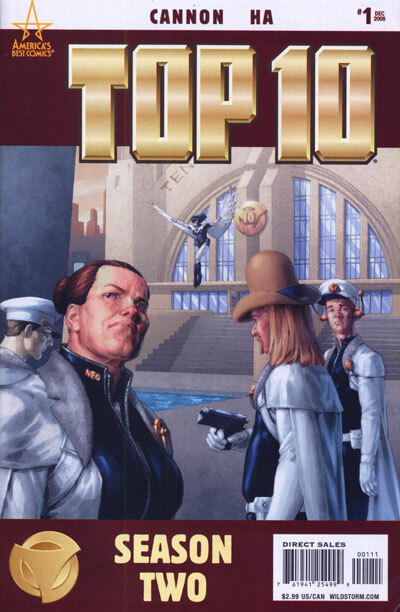 This coming Tuesday (3/10/09) at 7pm, I'm going to be giving a "reading" of an excerpt of Top 10 #4, the latest issue in the new iteration of the comic book series by Gene Ha and me. If you're wondering how one would give a reading of a comic book, that makes two of us. What I decided to do was to project the pages on a screen to allow people to read the comic themselves (as well as the layouts and script of those pages) while I give a sort of "director's commentary" there at the podium. The event is held at the Target Performance Hall at the Open Book building here in downtown Minnneapolis, and is free and open to the public. Come on by! Bring lots of questions! Kevin and Zander Cannon interviewed on Newsarama about T-Minus! 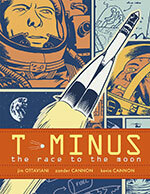 Michael Lorah interviewed Kevin and me about our upcoming book T-Minus: the Race for the Moon, coming in May from Simon and Schuster's Aladdin Books imprint. Written by Jim Ottaviani, the book covers the US-Soviet space race from a century before Sputnik up to the US moon landing 40 years ago this summer. 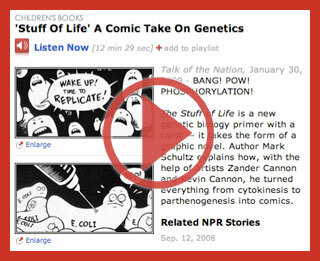 Listen to Mark Schultz on NPR's "Science Friday"
Zander Cannon at New York Comic-Con 2009! 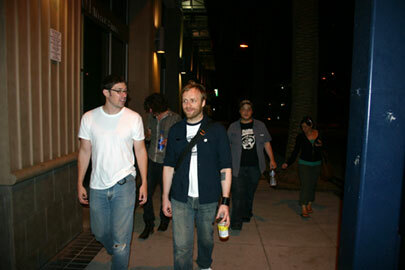 Hey, are you going to the New York Comic-Con on February 6-8, 2009? ME TOO! Come by my table; I'm in the Artist Alley, table B-6. I'll be doing sketches (full figure, grayscale: $60) and selling original pages, as well as a bunch of minicomics and books you may have not heard about. Zander Cannon and Gene Ha’s “Top Ten Season Two" is as good as Alan Moore, Gene Ha and Zander Cannon’s “Top Ten Season One." Just thought you should know. 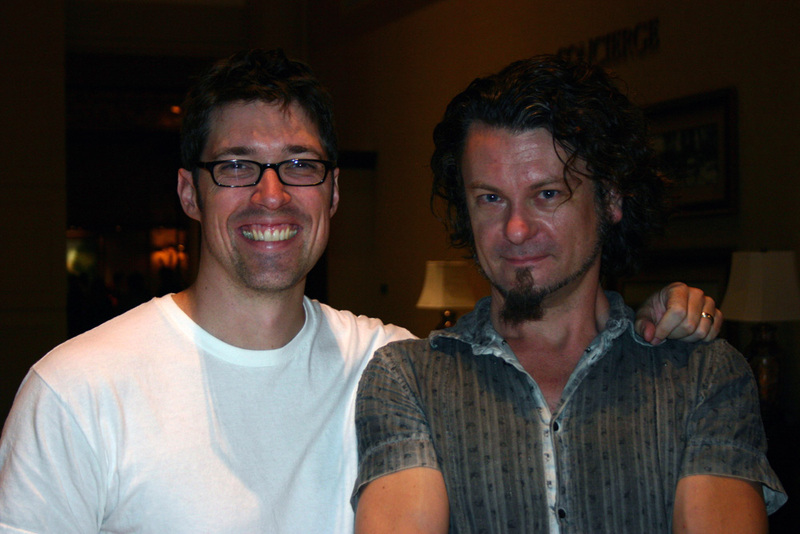 Zander and I recently sat down (via email) with Van Jensen and chatted about how we could possibly find a way to make a subject like DNA interesting. You can read this lively exchange at Comic Book Resources. Read the whole list here. Zander Cannon, Kevin Cannon, Steve Stwalley, and Danno Klonowski on KFAI FM! Kevin and I joined Steve Stwalley (Soapy the Chicken, Stwallskull) and Danno Klonowski (Staplegenius!) to chat with Britt Aamodt on the Wave Project at KFAI 90.3 FM last night. The show was called "The Cartoonists", and covered what it's like to be a cartoonist, what is the nature of cartoons as opposed to illustration, and various other chit-chatty stuff. We had a great time, and it was pretty cool to be in a radio station, getting our hands slapped away whenever we tried to touch the fancy microphones. Hang in there-- the previous show (an Oromo music show called Voice Of Oromiyaa) ran a little late, so the show starts at 1:38. Stuff of Life Video Online! 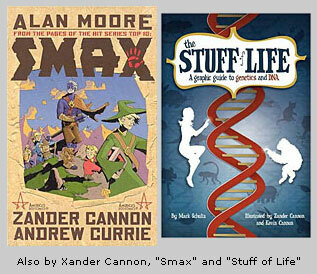 Our new graphic novel, The Stuff of Life, will be in stores on December 23rd, just in time for Christmas, if you hurry. 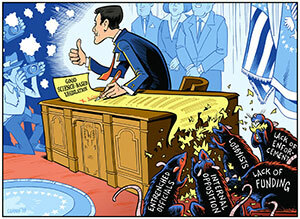 To whet your appetite until then, we have a cartoon to show you that will give you the gist of the book. Click the image to watch the video. If your computer can handle it, click on "watch in higher quality". 8. PUNY put it all together (magically, as far as I could tell). I expect that PUNY will put up a post about some of the animation techniques; I can only offer what it was like to do voices for a cartoon. 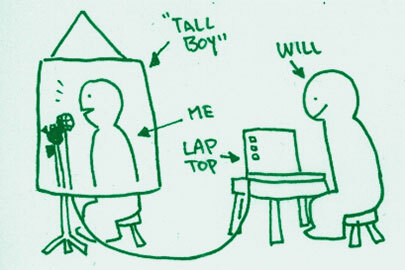 First, I went down to record in PUNY's high-tech interim sound booth (a foam cartoon character costume about 2 1/2 feet in diameter hung from the ceiling with a fancy microphone electrical-taped to an incompatible mike stand all wired to a laptop three feet away), . Will Shepard did the directing and sound editing (I actually spoke all of the lines several times before moving on to the next one, and I did the characters separately) and tweaked it all together to make it all sound funny and natural. All the little "ohh..."s and "A-ha"s were recorded completely out-of-context as a long stream of interjections, and he figured out where to put them in and make me sound like a pro. Nice work, Will! Every time I went down to PUNY to do voices, I saw the incrementally-more-finished sound booth in which one day, ONE DAY, I will record some voices. Probably for some energetic, educational cartoon dog. Finally, I offer my stunned amazement at how beautiful the animation was for this sequence. PUNY will have more detail on who did what, but all I can say is I think it looks fantastic. 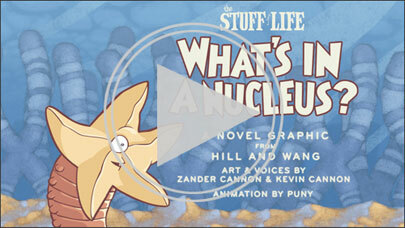 Hill & Wang's official The Stuff of Life page. which has Mike Owens' insights about animating the short, as well as some photos of the swanky sound booth. 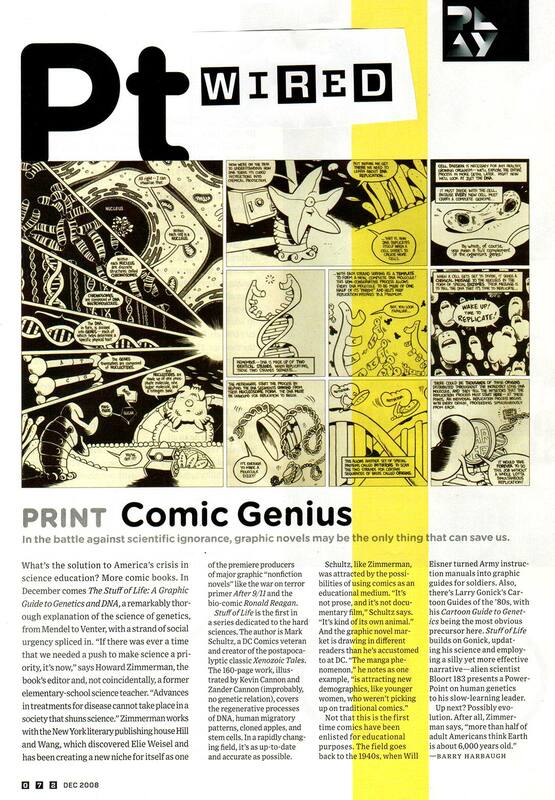 Wired's December issue has a great review of our upcoming graphic novel, The Stuff of Life. 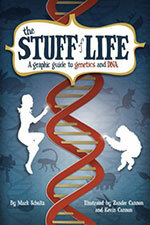 Stuff will be in stores on December 23, but in the meantime you can read more at www.theStuffofLifeBook.com. 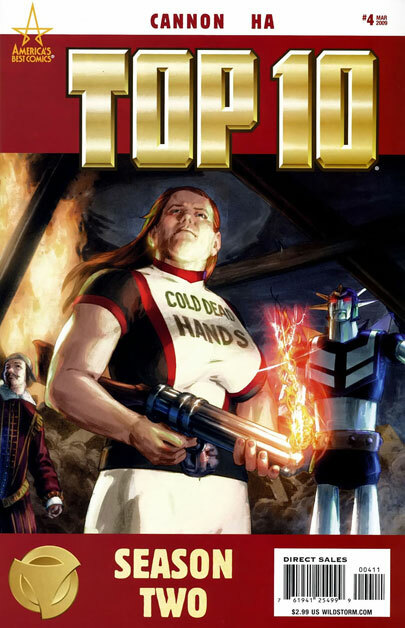 Top 10 Season 2 #1 out today! AMERICA'S BEST COMICS. A new season dawns in the science-city of Neopolis! A new commissioner, along with some new rules, comes to Precinct 10, as Slipstream Phoenix, a rookie cop with an ugly secret, fights for respect among his new peers. Meanwhile, Shock-Headed Peter and the Dust Devil investigate a mysterious, ancient drug dealer, and a very public multiple homicide sets Captain Jetman and Lieutenant Peregrine scrambling for answers. The police procedural crime and intrigue continue in this new series based on concepts and characters created by legendary writer Alan Moore (WATCHMEN, V FOR VENDETTA). This series picks up where the original 12 issue left off, with Smax and Toybox off on the adventure chronicled in Smax, and the rest of the precinct without an interim commissioner. Fans of the original Alan Moore-penned series will hopefully find this to be similar in tone, and reference-hunters will not be let down. First off, I have to give monumental thanks to Kevin and Shad, who came up with a good portion of the plotlines and gags (due to a clerical error, Shad was not credited in this issue; I am told he will be in future issues), and were extremely helpful in getting this series going. I probably needn't say how fantastic Gene Ha's art is on this series, but I will anyway-- he delivered pages that took my humdrum ol' layouts and turned them into the fantastic science-city of Neopolis-- again. Thanks, Gene. I've seen what he's done for the next couple issues, too, and it's amazing. So go on down to the comic store (or, if you're in the Twin Cities, come to FallCon this weekend) and get yourself a copy. Gene will be in town for the show this weekend and we'll both sign it! UPDATE 2: The reviews just keep on coming! 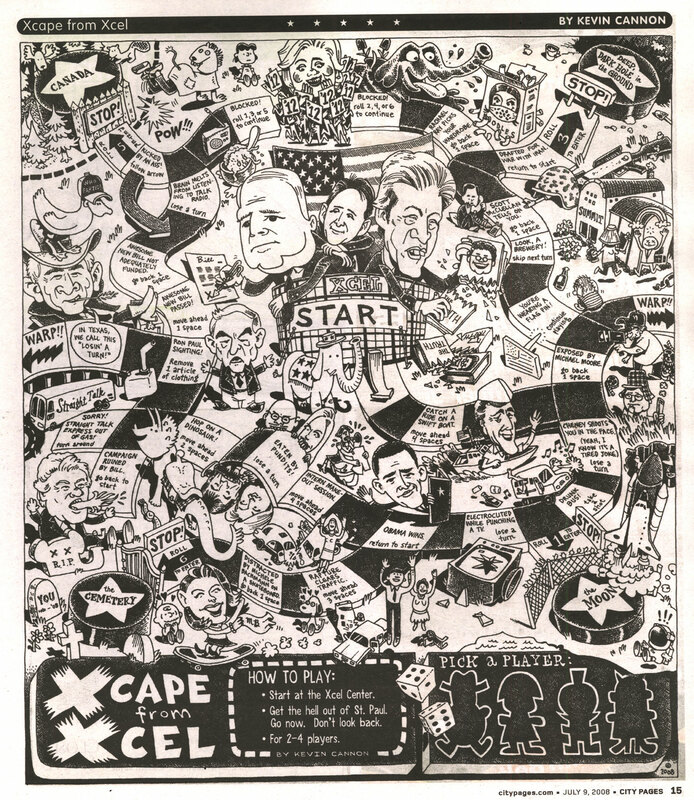 Kevin and Zander's City Pages Cartoons about the Republican National Convention are in Print! It's sort of a long story, but both of our Republican National Convention cartoons that we did for the City Pages have finally seen print! 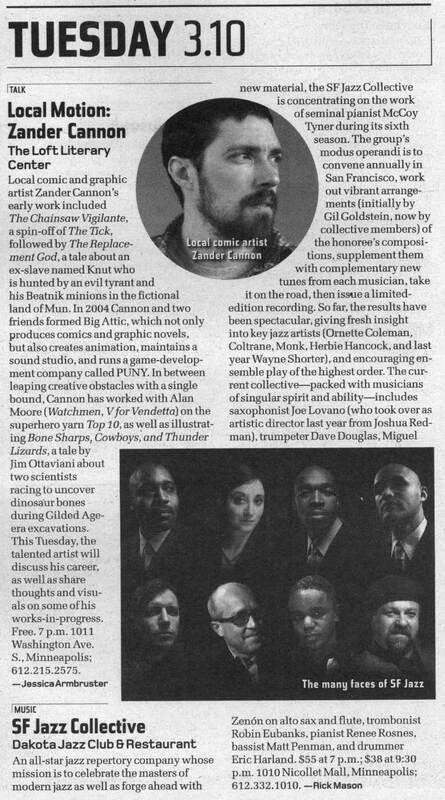 Kevin's in the July 9 edition, mine in the August 27 edition. Neither Kevin nor I are big political cartoonists, but the City Pages threw down the gauntlet and we obliged. The people of the City Pages were good enough to put my cartoon in a later edition when an email mixup prevented it from being in the first one. Thanks, folks! 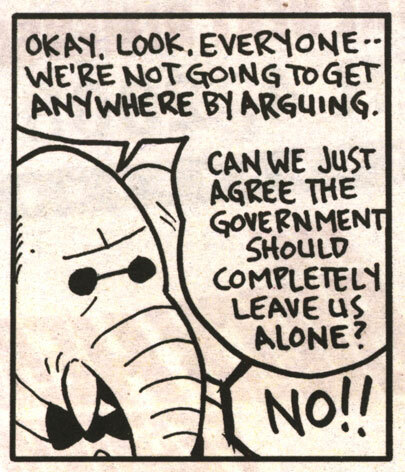 You can find all of the RNC cartoons at the City Pages website; there's a heck of a lot of great stuff on there, and our beloved Cartoonist Conspiracy is well-represented. This is the second year that the City Pages has put together a comics issue; last year's was "Tales of the Twin Cities", and Kevin's and my cartoons ran side by side in that one (as opposed to being separated by 7 weeks). Here are some behind the scenes photos of the long, arduous process of shooting a 20 second bumper for G4. Oh the grueling days, oh the sleepless nights. Oh the well-stocked catering table. It was the toughest four minutes I'll ever love. Thanks to Shad for the photos! On Saturday night, I ended up running around with my old friends from my New England Comics Press days: Ben Edlund and Jackson Publick. Zander's on G4's Attack of the Show! Some dudes with cameras and large personalities came by my booth at Comic-Con on Thursday and wanted to film a concluding segment for their video convention report. Would I please sketch while Zach Selwyn wraps it up in Attack of the Show style? Why certainly! I'm thrilled to announce that the "Twin Cities Rock Atlas" has been nominated for a 2008 AltWeekly Award in the category of "Innovation." The Rock Atlas originally appeared in the 11/19/07 edition of City Pages, the Twin Cities' big weekly alternative paper. 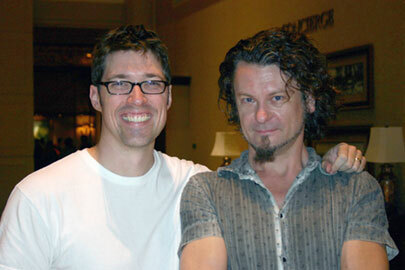 The Atlas was written by Peter S. Scholtes and art directed by Nick Vlcek. 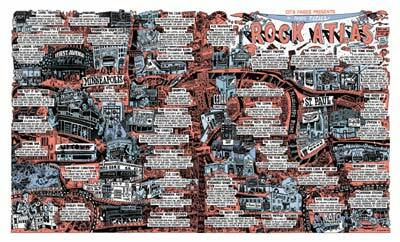 You can see the Rock Atlas on the City Pages Blotter and read about the art process on the Big Time Attic blog. Note: the original art from the Rock Atlas is currently on view at Altered Esthetics gallery in NE Minneapolis (through May 31). This is the last time you or I will ever be able to see it in public! In a previous post, we told you that for over two years now we've known that our graphic novel Bone Sharps, Cowboys, and Thunder Lizards would appear in a scene from HBO's "Tell Me You Love Me" pilot. At first I was a little disappointed. Initially it looked to me like the actors were adlibbing lines -- treating our precious book as nothing more than a prop. But NO! The two parents read an actual panel from page 55 AND, to smother icing on an already towering cake, the way the panel is read provides the only humor in an albeit intentionally humorless show. We should note that the scene was shot in a mirror, hence the horizontal flip of the cover. Something to do with metaphors. Will Bone Sharps continue to be featured in every episode of "Tell Me You Love Me?" Probably. We'll just have to watch closely and find out. In episode 4, at 0:12, the dad (Dave) implies that he has read Bone Sharps to his son one hundred times. Hey, the January issue of Metro Magazine, an excellent monthly about cool stuff in the Twin Cities, had a sidebar talking up the best local blogs. Check it out! We're the best local comics blog! Big thanks to Chuck Terhark for the traffic spike. Also thanks to LA for the heads-up. Muscles & Fights Signing at The Source: This Saturday! 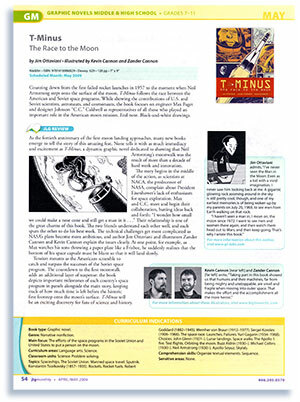 The Pulse feature on "Bone Sharps, Cowboys, And Thunder Lizards." 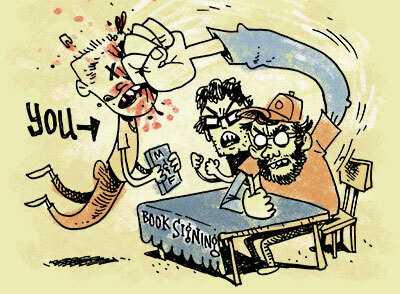 CONTINUITY GUY Book Release Party This FRIDAY!